Gleaners Community Food Bank of Southeastern Michigan has named Michelle R. Sherman as its new chief financial officer. Prior to joining Gleaners, Sherman worked for Barden Companies Inc. in a variety of positions; most recently as the CFO and special trustee. 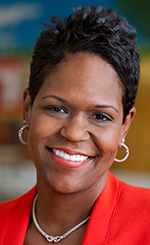 At Gleaners, Sherman will oversee the finances of the Detroit-based nonprofit that distributed more than 30 million meals to over 435,000 people in southeastern Michigan in 2014. As CFO she will work closely with the president, board of directors, and senior leadership to develop and implement financial strategies across the organization while adapting Gleaners’ practices to a continually evolving environment. Sherman has served on a variety of professional and civic boards and committees over the last 25 years. She serves on the advisory board of directors for Multicultural Business Programs, the Eli Broad College of Business, and Michigan State University. Sherman, of Southfield, graduated from Michigan State University with a Bachelor of Arts in accounting, earned a Master of Science in International Finance from Walsh College. She is a certified public accountant in the state of Michigan.